The big day is planned and you’re looking for something that means more than a store bought tiara to top off your beautiful dress. Whether you are looking for a traditional / classic wedding tiara or one with a more vintage appeal, I am confident we can come up with the perfect tiara for your special day. 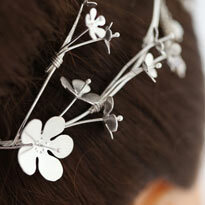 Every wedding tiara is designed with your input and ideas. It is then handmade and fitted to ensure it not only looks perfect but the fit is too. Fitting adjustments will mean less hassle on the day and the tiara will stay where it should – you have enough to think about as it is! Choose what you would like to adorn the tiara with – be it fresh water pearls, dazzling crystal beads, or fashioned from sterling silver or gold – your tiara will be something you’ll want to keep as a reminder of the memorable day.